Despite its proven effectiveness at promoting oral health in a safe, cost-effective, and equitable manner, water fluoridation cannot win on its scientific merits alone. Unfounded claims and half-truths promoted by a very small but vocal, well-organized minority opposed to water fluoridation have prompted a longstanding, heated political discourse. Health Resources in Action (HRiA) has piloted an integrated approach, based on social marketing and community mobilization, to increase the number of New England communities accessing fluoridated water. In 2012, with the support of the DentaQuest Foundation, HRiA began a multi-year project to design, implement, and provide strategic counsel to two community water fluoridation campaigns. HRiA collaborated with statewide oral health coalitions, local coalitions (the Upper Valley Oral Health Coalition in Vermont and the Greater Brockton Healthcare Alliance in Massachusetts), and community organizers; the goal was to help the coalitions expand their own capabilities by tapping into community stakeholders, policymakers, and opinion leaders with messages that resonated with the communities to promote the public health benefits of water fluoridation in their communities. In Brockton, MA,the group gained support for fluoridation from over 20 local organizations and hundreds of residents, and in Hartford, VT, HRiA supported community members in testifying in front of the Board of Selectmen. 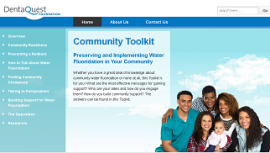 As a culmination of this work, HRiA is excited to announce the release of Community Toolkit: Preserving and Implementing Water Fluoridation in Your Community. The toolkit helps communities develop effective communication messages, identify and work with allies, and gain community support. This web-based toolkit is designed for community members, coalitions, and anyone else who is working to implement or promote water fluoridation.